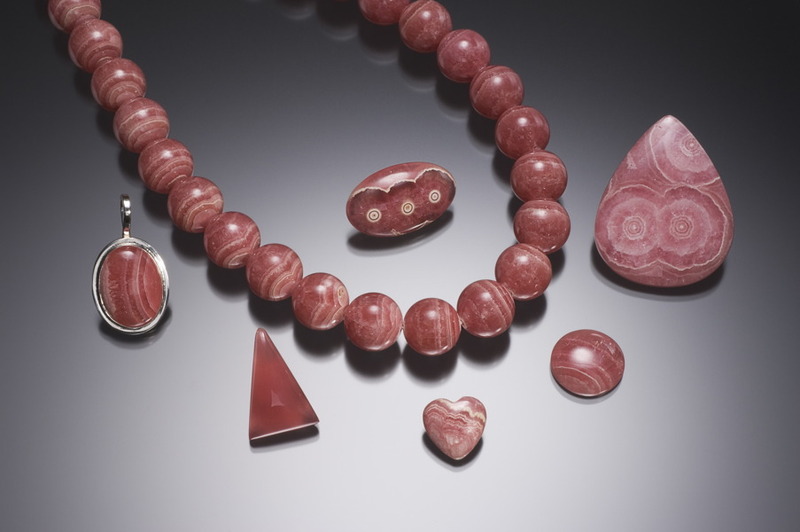 We sell a wide variety of rhodochrosite jewelry as well as cabochons, faceted stones, carvings and beads. Some of these items are in the Internet Store. You can click the link below to view some of the items. The photograph above is a nice selection of Rhodochrosite from Argentina photographed by Jeff Scovill. Although the photograph above shows Rhodochrosite from Argentina, the Internet Store will have a variety of locations represented for Rhodochrosite. There is a section devoted to Rhodochrosite from The Sweet Home Mine and a page for Rhodochrosite from the Wudong Mine in China. As always, contact us for specific needs. We sell rhodochrosite from all worldwide localities including Argentina, Colorado, China, Peru, Romania, and South Africa to name a few.